Never miss a modifier again! 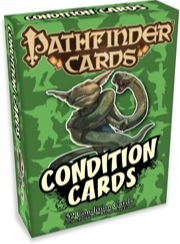 With Condition Cards, it�s easy for players and GMs to keep track of the Pathfinder RPG�s most common conditions. Did the bard fascinate your party? Is your wizard invisible? Is the fighter bleeding out? Simply hand out the appropriate condition cards to have all the rules for each condition at your fingertips. This set of 52 hilariously illustrated, full-color cards allows you to play faster and more easily than ever before. Also included is a new spell, soothing word.